Paving The Way. A night of laughter, an honest amount of swearing & huge dose of inspiration. PAVING THE WAY. A NIGHT OF LAUGHTER, AN HONEST AMOUNT OF SWEARING & A HUGE DOSE OF INSPIRATION. You may have heard us mention before that One Roof is much more than a co-working space. We exist to foster an environment that gives women-led businesses the greatest chance of success. Curated introductions, hosting events, creating platforms for people to network and inviting successful entrepreneurs to inspire and educate are just some of the many ways One Roof supports our members and elevates the broader community to success. On Tuesday the 27th of November we hosted Paving The Way. While One Roof prides itself on paving the way for women in business, we wanted to hear from other entrepreneurs who are paving the way in their own industries. 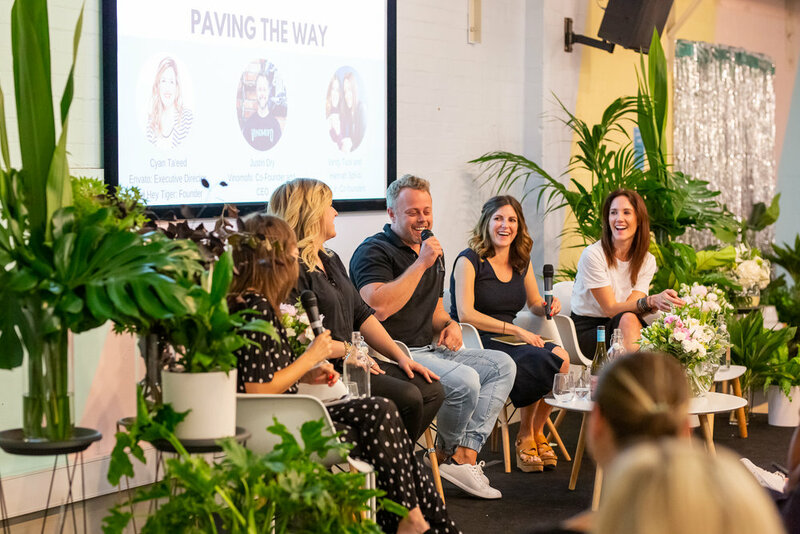 So we invited four of the most impressive and successful entrepreneurs we know who are trailblazers, shaking it up, doing things differently and building successful companies with profound impact. Justin Dry, Cofounder of Vinomofo. Cyan Ta’eed, Cofounder of Hey Tiger and Envato. Hannah Spilva & Verity Tuck, Cofounders of LVLY. And they absolutely rocked the room! They brought the perfect balance of being engaging, witty and humble. In fact, at times they were absolutely hilarious and had the whole room in fits of laughter. Before we even delved into what they do and how they build their businesses, we asked them to share who are they as human beings. What are their passions, hobbies, quirks, what excites them, annoys them, all the things that make them human. There was a common theme around being born into entrepreneurial families (Particularly Justin and Hannah) and see the highs and lows of entrepreneurial life from a young age. They all love time with their partners and families, the simple things like watching movies and going to the gym. Failure was, of course, brought up many times in the conversation. Justin reminded all of us that most successful entrepreneurs go through a multitude of businesses (at least 5 or 6) before they hit a successful one. Hannah and Verity spoke about the importance of failure. If you’re not failing then you’re not doing enough to move yourself forward. Failure is brutal but often crucial to the entrepreneurial journey. This was a HUGE topic thanks to Justin! Most Founders tie their entire existence and identity to their business and if their business fails then they fail as a human being. It takes a lot of courage and personal development to really be able to detach yourself and your identity from your business. Our favourite topic of conversation was acknowledging the bullsh*t (there was a lot of swearing on the night!) phrase of work / life balance. If we are striving for work / life balance it just doesn’t exist. There is just LIFE. What works for one person may not work for someone else. We are all different and should live life according to what makes us happy. Of course, as Cyan aptly pointed out, self-care is what is most important particularly for founders. 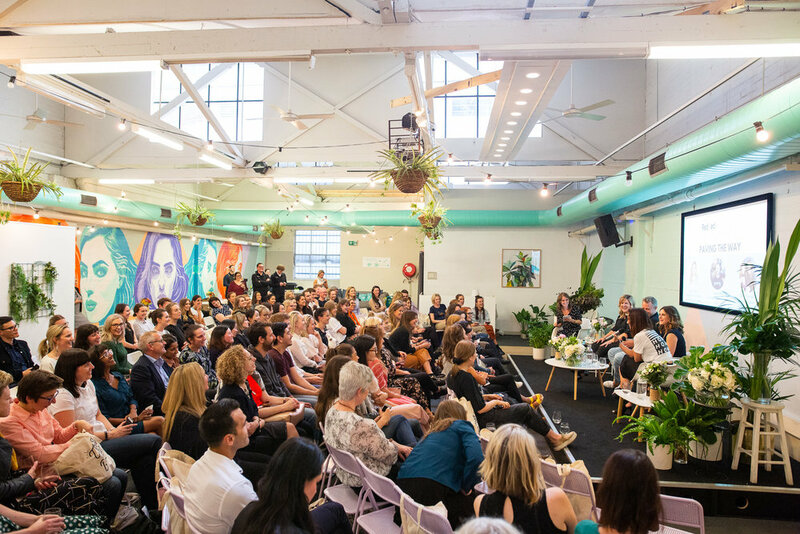 We spoke about the future and Cyan shared her vision for Hey Tiger being a recognised leader in how a business can be a successful for purpose social enterprise. Hannah and Verity were asked a question from the audience about business partnerships. Having complimentary skillsets, setting ground rules early on and being able to communicate openly, honestly and most importantly to be able to have the HARD conversations, are crucial to a successful partnership. Hannah and Verity actually shared a wage between them when Hannah was waiting for her work visa. Now that is a strong business partnership! Everyone will give you unsolicited advice. Listen to everything everyone has to say but ignore 90% of it. Go with your gut and what’s going to work for you. They were all really good sports when it came to the fun facts and rapid fire questions. We all learnt that Justin has a love for islands and visualises wearing a superhero cape when he is doubting himself. Cyan has highlighted her way through Tribe of Mentors by Tim Ferris and when she was 12 she played a bald monk in the Australian Opera's production of Turandot. Hannah’s role model is her dad and Verity lives by the mantra Grit. Grace. Gratitude. They both encouraged everyone in the room to own their impact. It's okay to hold your hand up and say you did something awesome. Celebrate your wins and pat yourself on the back. A BIG thank you to RedZed Lending Solutions for partnering with us and sponsoring this event. A great company and a pleasure to work with. Sign up for a one week free trial with One Roof to get a sense of the space, our community and the business support we provide. Your success is our obsession!